Filmmaker Marcela Zamora will discuss her work after the screening of her film "María en tierra de nadie." 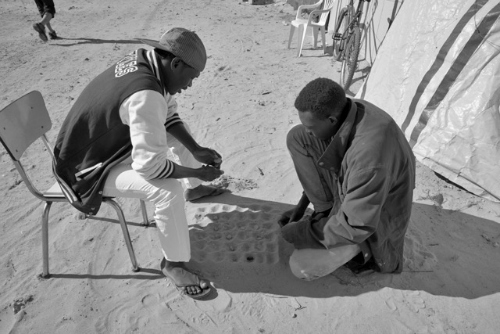 Migrants pass the time using depressions in the sand for a gameboard, one in a series of photographs by Lewis Watts from a refugee camp near Calais, France. Human migration, borders, and notions of citizenship are at the heart of a series of events that help celebrate the 15th anniversary of the Department of Latin American and Latino studies at UC Santa Cruz, cosponsored by the Chicano Latino Research Center. The department was the first of its kind to combine Latino studies with Latin American studies when it was established in 2001 after 30 years as an undergraduate program and major. In 2013, the department launched the first Latin American and Latino studies Ph.D. program in the country. 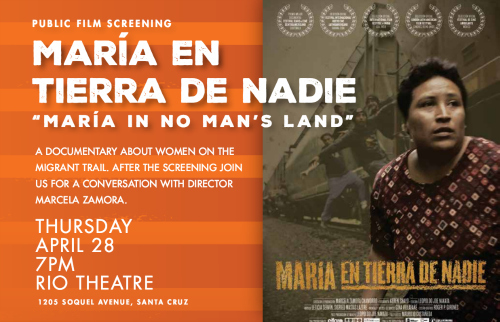 The series begins Alumni Weekend with a free public screening of the film “María en tierra de nadie / Maria in No Man's Land” and a discussion with its director Marcela Zamora. It kicks off “Borders and Belonging: A Series of Events on Human Migration” presented by the Chicano Latino Research Center. The film screening will begin at 7 p.m. Thursday, April 28 at the Rio Theatre. It is free and the public is invited; attendees are asked to register in advance. The next day, Friday, April 29, will be “The Jungle and the Beast: A Conversation with Lewis Watts and Óscar Martínez” from 10 a.m.–noon at the Merrill Cultural Center on the UCSC campus. It, too, is free and open to the public with advance registration. The events are also a lead-in to the Andrew W. Mellon Foundation Sawyer Seminar on non-citizenship that begins with “Rethinking Migration,” a two-day conference May 6 and 7. The conference will feature several visiting scholars and UCSC professors in the humanities and social sciences who will focus on issues surrounding migration. “Since its founding in 1992, the Chicano Latino Research Center has supported scholarship on migration, borders, and citizenship. The events we’re planning for this spring and the upcoming academic year will allow us learn from others and to share a bit of the expertise scholars at UCSC have worked hard to cultivate,” said Catherine S. Ramírez, associate professor, Latin American and Latino Studies, and CLRC director. 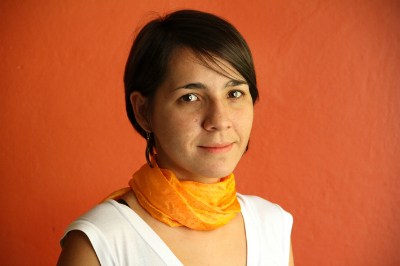 Journalist and documentary filmmaker Zamora made “María en tierra de nadie” in 2010, filming in El Salvador, Guatemala, and Mexico. Her documentary focuses on Salvadoran women migrants and their perilous journeys north through Mexico to the United States. Zamora has made 14 films about gender and human rights, including “El cuarto de los huesos / The Room of Bones,” a documentary released last year about the effort to unearth and identify disappeared people in El Salvador. She studied journalism in Costa Rica and documentary filmmaking in Cuba and has worked for Al Jazeera, TeleSUR, and Elfaro.net, Latin America's first online newspaper. After the screening, Zamora will discuss her work in a Q&A with UCSC professors John J. Leaños, film and digital media, and Cecilia Rivas, Latin American and Latino studies. The Jungle and the Beast event on Friday, April 29, features Salvadoran journalist Óscar Martínez, who wrote The Beast: Riding the Rails and Dodging Narcos on the Migrant Trail (2013). The “Beast” is a freight train that travels from Central America through Mexico to the United States and gained notoriety in “Sin Nombre,” the first feature film by UC Santa Cruz grad Cary Fukunaga. Martínez accompanied Central American migrants who stow away on the Beast to ride north. He will discuss his experiences with UCSC Professor Emeritus Lewis Watts who, last fall, photographed migrants from Africa, Asia, and the Middle East in “the Jungle,” a refugee camp near Calais, France. Watts will also show and talk about his photographs. Jennifer González, professor of history of art and visual culture, will moderate their conversation. “Borders and Belonging: A Series of Events on Human Migration” is supported by the UC Santa Cruz Foundation, Chicano Latino Research Center, Division of Social Sciences, University Relations, Institute for Humanities Research, and Department of Latin American and Latino Studies.